Working on your Mac, you might have multiple instances of same files or folders. E.g. this could happen every time you backup your photos or movies from iPhone to another folder, backup, re-save copy files, download them. As well you can have multiple copies of files and folders while uploading or downloading files to cloud storages for sharing, downloading files from the Internet, or just from portable storages. 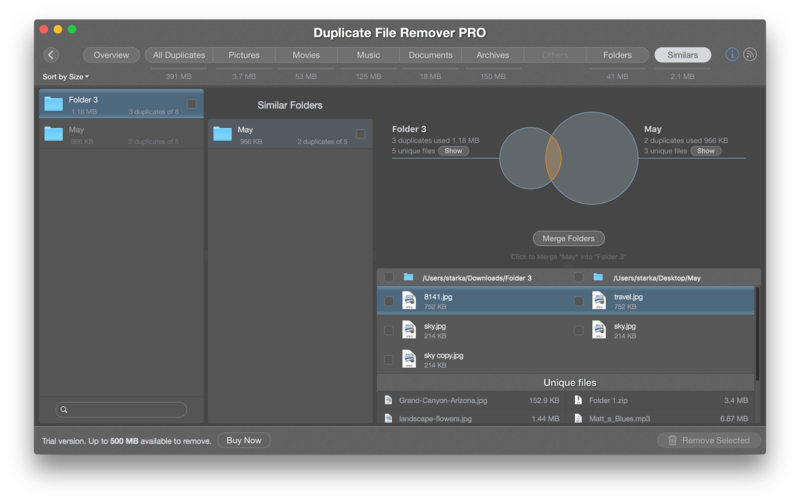 Duplicate File Remover Pro finds your duplicate files and folders. Then, you can organize folders, remove duplicates and get your files in right place. Note: You might have duplicate files or even multiple duplicates in a folder, or whole folder as a duplicate. To get started, specify a folder to scan, start searching. After several minutes Duplicate File Remover Pro will provide you with easy-to-use visual scan results like the one below. Duplicate files are grouped by type. 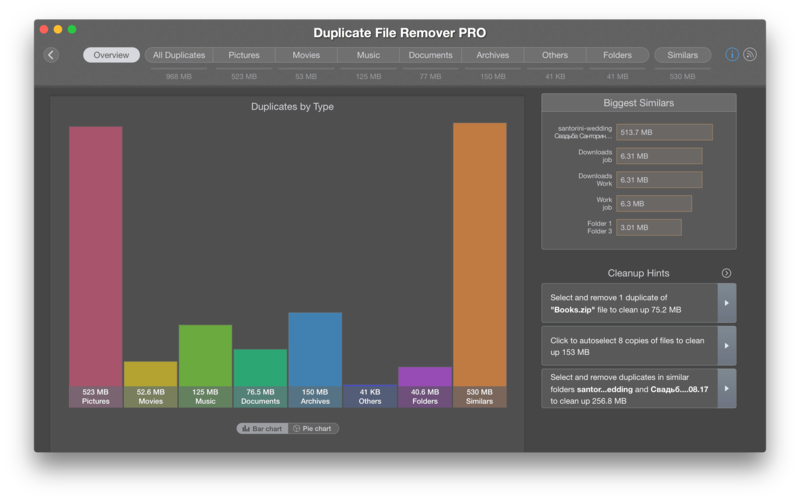 You can follow Cleanup Hints, or manually select and remove unneeded duplicates. Switch to any file type category review and remove duplicates. Follow the same way with duplicate folders. 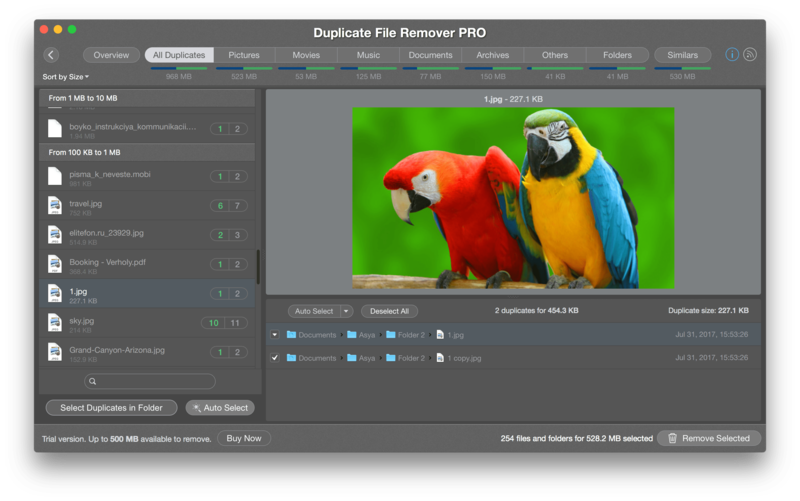 Duplicate File Remover Pro finds duplicate files, folders and even folders with similar content inside. Similar folders partially duplicate, that also contain unique files comparing to each other. That’s really a challenge to find such folders and sort them out. We called such folders Similars. 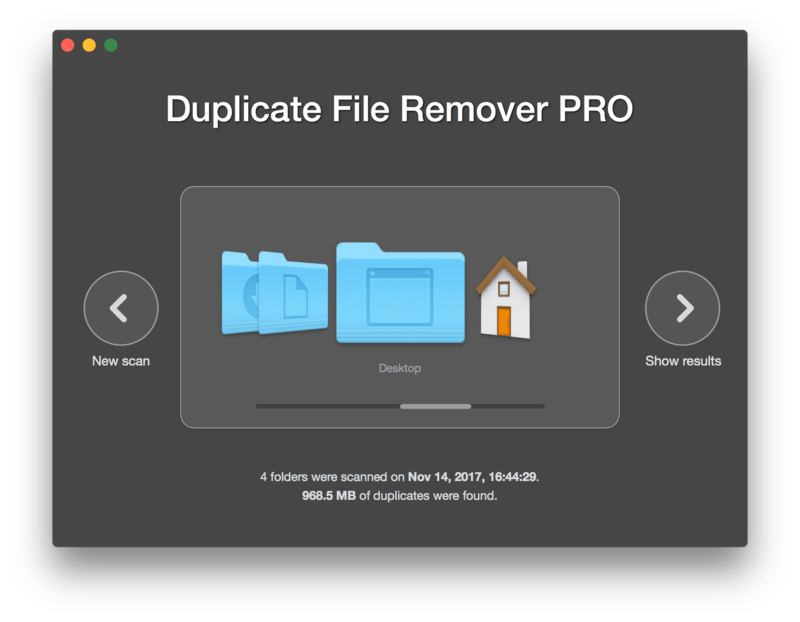 Duplicate File Remover Pro also helps you in troubleshooting this task. After similar folders were found, they are displayed in Similars category. Switch to any file type category to preview found duplicates. Select unneeded duplicates and click on Remove selected button to review selected files and confirm removal.